(Nanowerk News) A Navy-sponsored project to design a biologically inspired, swimming jellyfish robot has led scientists to the surprising discovery of common bending rules for the tips of wings, fins, flukes, mollusk feet, and other propulsors across a broad range of animal species. The study, led by John H. Costello of Providence College and the Marine Biological Laboratory (MBL) in Woods Hole, where he is a visiting scientist, is published this week in Nature Communications ("Bending rules for animal propulsion"). 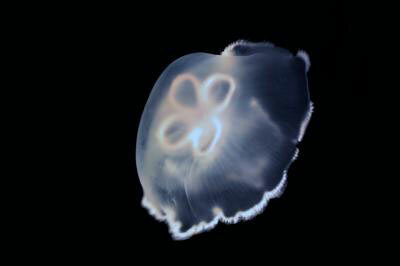 Engineers are collaborating with biologists to replicate the jellyfish's efficient motion in a swimming robot. "We were interested in looking at how many animals use flexible margins (or tips) on their propulsors because we know in the jellyfish vehicle, propulsive proficiency improved by orders of magnitude when we put a passive, flexible, silicone margin around the [jellyfish] bell," Costello says. "The question for us was, how and why does flexibility increase thrust? And from an engineering standpoint, how do you incorporate flexibility into a design so it does increase thrust?" The team looked at natural propulsors, which have had millions of years to evolve design efficiencies, for guidance with their models. "We found that the way the propulsors moved—the kinematics—seems to be selected for across this wide range of animals, rather than the material properties, such as feathers or scales, being key," Costello says. "Discovering these uniform bending characteristics has reoriented our search for understanding the advantages of flexibility in propulsion." The paper's lead author, Kelsey N. Lucas, was an undergraduate advisee of co-author Sean Colin of Roger Williams University at the time of the study, and is now a graduate student at Harvard University. Colin is also an MBL visiting scientist and principal investigator with Costello on the Navy's jellyfish robot project. "Flying and swimming animals have a much lower cost of transport (energy needed to move a mass a given distance) than present manmade designs of similar scale," Costello says. "That is part of our motivation for understanding biological design: Animals do it better."